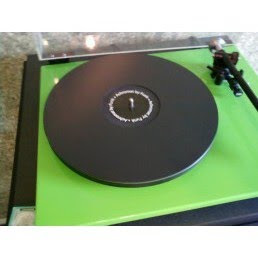 I've just spent some time comparing the Achroplat II and Achromat replacement platter and mat with my Rega P3-24. The Achroplat II, as I've previously mentioned, is a new version that has been machined to fit with the GrooveTracer machined subplatter (a modification that I could not live without, quite frankly), and I've come to the conclusion--for now--that the Funk Firm products offer an extremely worthwhile increase in performance over the stock glass platter and felt mat from the Rega. In the past I've always warned against replacement mats and platters for Regas. Acrylic platters, in particular, tend to rob Rega turntables of their fast, energetic nature. In a nutshell they sound a little dead and lifeless in comparison and create an overall sound that resembles something like a lesser VPI. My running joke has always been that if you want your Rega to sound like a VPI, you should have bought a VPI in the first place. I'm happy to report, however, that both the Achroplat and the Achromat retain that vital Rega sound and only increase my enjoyment of the sound. The Achroplat II is the more radical of the two mods (at a slightly higher price, as it should be). I listened to the first three tracks of Anja Garbarek's Smiling and Waving LP, an LP I often choose for listening sessions for its combination of detail, delicacy and marked contrast between its naturally recorded elements and electronic/sampled touches. The Achroplat excelled in expanding the size of the soundstage in every direction, and for reaching further into the grooves and extracting more details. If you're looking for a more expansive, detailed sound for your Rega, this is the way you should go. The Achromat, which I used with the stock glass platter without the felt mat (obviously), offered a distinct yet equally intriguing option. While it didn't retrieve the same amount of detail and transient decay as the Achroplat, it offered a smooth, warmer sound that is more in line with the typical sound you may get from tubed amplification. After going back and forth with the Achroplat, I discovered that I could live with either sound. I must say, however, that this opinion may change as I listen to different types of recordings. When I substituted the felt mat for the Achromat, I didn't immediately retch and vomit. The stock solution is still extremely musical, but I did sense a smearing of some minor details in the mix, and I noted that the overall presentation sounded a little more homogenous and didn't quite leap out at me with the same immediacy as the Funk Firm products. 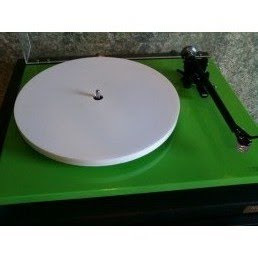 Then there's one more slightly important consideration: the white Achroplat looks extremely cool, and I like the way it makes the Rega looks like a much more serious 'table--something like the Funk Firm Vector TTs. Does this matter? I always maintain that it does in terms of pride of ownership, if not ultimate sound quality. Dyed-in-the-wool audiophiles may not admit this is important, but often it secretly is! The cost of the Achroplat II is $249. The Achromat is $149. If you're looking to get a little more performance out of your Rega P3-24, then these upgrades are more than worthwhile. I want to keep at least one of them, but which one? I'll know for sure after I've listened for a while longer. But if you're intrigued, then give Dan Muzquiz of Blackbird Audio Gallery a shout at 619-449-2787, and he'll hook you up. Jeeze man, I've tried, Lord knows I've tried and I cannot hear these differences in TTs you speak of. Sometimes I just think your imagination gets the better of you and you hear what you want to hear. Personally I find sonic differences between turntables very difficult to hear (and yes I have listened painstakingly). I do hear subtle differences between mats. Whereas I find differences between cartridges far more noticeable as they swamp out TT differences. Recently I heard a well lubricated Dual 601 with custom mat/clamp and Shure V15 - SAS stylus... then the same cartridge installed on an Avid TT at many times the price and honestly I could not hear a bit of difference. They both sounded excellent. Sorry Joe, but I routinely hear big differences between turntables and so do many other people. If we didn't, the turntable industry would shrink dramatically and maybe even disappear. The idea that an old Dual sounds the same as a new Avid would probably be scoffed at by a majority of audiophiles. If you don't hear differences between turntables, don't sweat it...you'll probably save a lot of money! But it's very insulting to suggest that these differences are imagined by others. I think maybe you should start with the Performance Pack which I believe gives you the glass platter and a better mat. It also replaces the Ortofon OM-5e cartridge that comes with the RP1 and replaces it with the Rega Bias. This pack usually costs less than $200 and yields big results. Going with a Groovetracer subplatter would definitely take it up a notch. The problem is that you mention a bunch of options that would all result in big improvements. At this point it just depends what your budget is. If buying a Gyro SE is an option, by all means get THAT. The difference in performance between an RP1 and a Gyro SE is huge. The reason I brought up the Performance pack is that some dealers will throw an even better cartridge into the deal. Get the Performance Pack, a better cartridge (maybe a Dynavector 10X5 or an Ortofon 2M Blue) and then STOP. Putting $1000 into an RP1 is a waste of money.